VFLs can be used in both multimode and singlemode fibers. 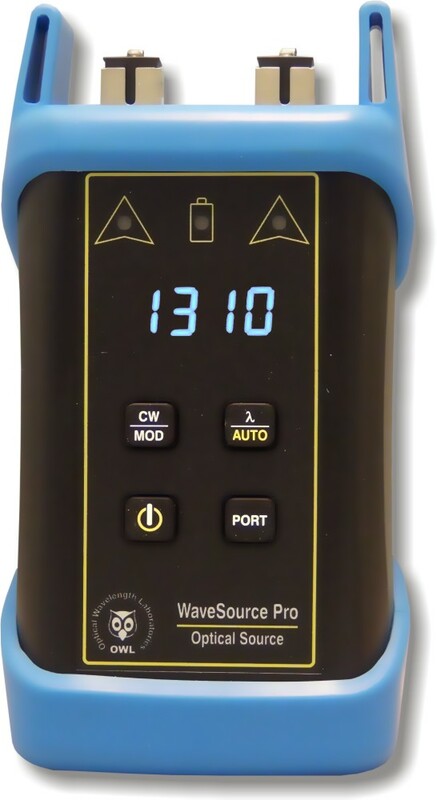 All versions of the WaveSource Pro have two transmission modes: Continuous Wave (CW) for accurate temperature-stabilized fiber optic tests; and modulated mode. In addition, WaveSource Pro light sources speed up the testing process through an advanced feature called AUTO mode when used with a Fiber OWL 7 optical power meter. While in AUTO mode, both the WaveSource Pro and Fiber OWL 7 automatically switch between two wavelengths, so that both wavelengths can be measured simultaneously. This eliminates much of the guesswork during testing, and saves valuable time. WaveSource Pro light sources come configured with SC connector ports. ST or FC connector ports are available upon request. 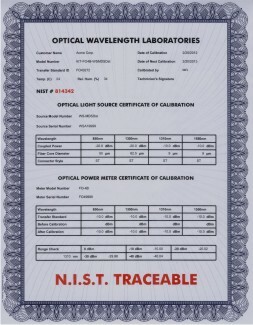 Automatic Wavelength detection when used with the Fiber OWL 7 optical power meters! Why is NIST traceability important? Custom wavelength combinations may also be available. Call us at 262-473-0643 for more information. 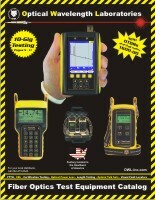 *Visual Fault Locators (VFL) can be used in both multimode and singlemode fibers. NEVER BUY ANY SOURCE WITHOUT U.S. GOVERNMENT N.I.S.T. TRACEABLE ACCOUNTABILITY!